Does any animal evoke a stronger sense of prairie than the plains bison? Bison at The Nature Conservancy’s Niobrara Valley Preserve in the sandhills of north-central Nebraska. Click on the image for a larger, sharper view. On this Thanksgiving, I am grateful for many things. Among those is the opportunity to take my kids to see bison on large tracts of native prairie. I hope they’ll do the same with their own kids someday. This entry was posted in Prairie Animals, Prairie Natural History, Prairie Photography and tagged bison, grassland, nature conservancy, nature photo, nebraska, niobrara, niobrara valley preserve, photo, photography, plains bison, prairie, sandhills, thanksgiving, the nature conservancy by Chris Helzer. Bookmark the permalink. The fact that there at all is something to be thankful for. Maybe some day I’ll actually get to see them. Happy Thanksgiving! The Boss…………so that is what I titled it. Have a happy thanksgiving and stay warm. Happy Thanksgiving to the Helzer Family!! I need to get out there and visit sometime, Chris. One thing to be thankful for is a year of your great photos and information. Take good care!!! Happy Thanksgiving to you and your family. And your posts and pictures are one thing to be grateful for – still carry sand in my shoes — so the pictures mean alot to me. Whether you agree or not that the bison are appropriate for the eastern tallgrass prairie, you can’t deny the appeal of this mega fauna. Nachusa Grasslands is an inspiring place to visit. I am sure that once the bison are in place many more folks will discover Nachusa. Fermi Lab already has bison. To me, the question of appropriateness comes down to whether the site biodiversity is enhanced or diminished by the presence of bison. One could also add the human factor, that having bison on a site imposes some restrictions on human (tourists’ and field biologists’, alike) access and freedom of movement. Anyway, they sure are cool to see, and I’m thankful for that. A lot of research has gone into determining the impact (positive or negative) of grazing on the dynamic of grassland ecosystems. Chris has shown how grazers focus on grasses giving forbs an opportunity to grow. However, Chris also over seeded a degraded prairie while using grazing to suppress grasses. The results from over seeding with grazing did not seem overly encouraging. It seems other unknown factors are likely more important than grazing alone. We know a lot about bison’s effect on grasslands, what I do not know much about is bison’s effect on woody species. Prairies that receive frequent burning still are being invaded by tree species. I would like to know the impact, if any, of bison on trees that are encroaching upon our prairies. To me, your bison looks like nature’s version of a seppi mower. 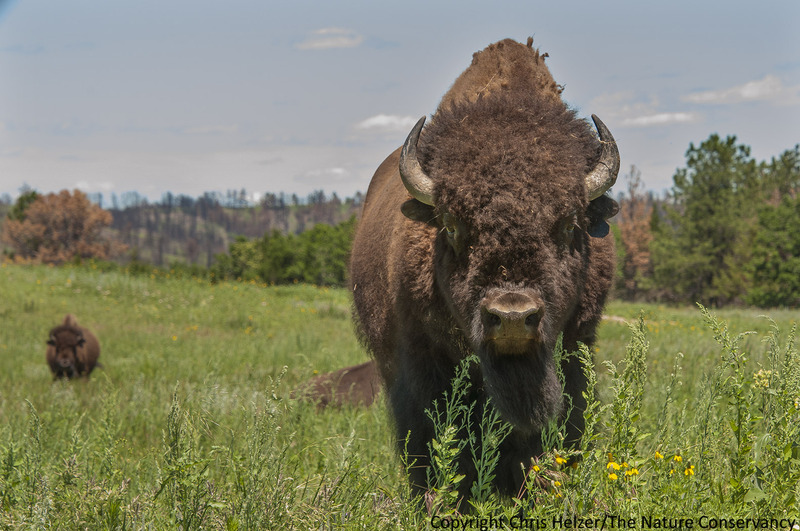 Some observations of bison’s impact on woody species might go far in convincing land managers of their necessity. Bison generally avoid wooded areas and trees, though they can have some impact on trees through rubbing. I don’t think the presence of bison in eastern tallgrass prairies will have much impact on tree encroachment, unfortunately. They completely rubbed the bark off all the spruce trees in their enclosure at Brookfield Zoo. You might find this paper interesting – from aspen parkland; Campbell, C., I.D. Campbell, C.B. Blyth, and J.H. McAndrews. 1994. Bison extirpation may have caused aspen expansion in western Canada. Ecography 17:360-362. The herd appears to be growing.